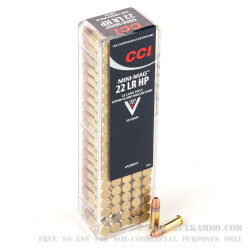 CCI Ammunition is some of the highest quality rimfire ammunition on the market. Founded in 1951 by Richard Speer, of the famous Speer family (Speer Bullets), CCI has been a trusted source of rimfire ammunition for over 65 years. CCI manufactures all of its ammunition and its many products for reloading on high tech equipment. All CCI products are built to the highest standards. 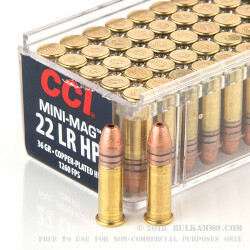 This CCI .22 LR is CPHP, or Copper Plated Hollow points. It is ideal for small game hunting, plinking, and target practice. 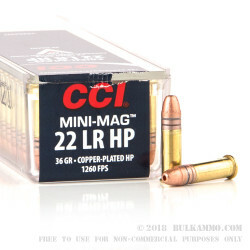 The mini-mag .22 LR ammo from CCI offers excellent performance and is some of the most sought after .22 LR ammunition on the market. This 22 long rifle ammunition has a velocity of over 1250 feet per second and a muzzle energy of 127 foot pounds. Of course, this ammo is rimfire primed with a brass case. 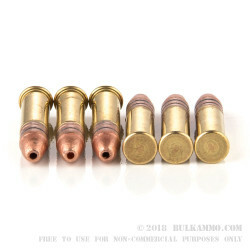 The bullets are copper plated.